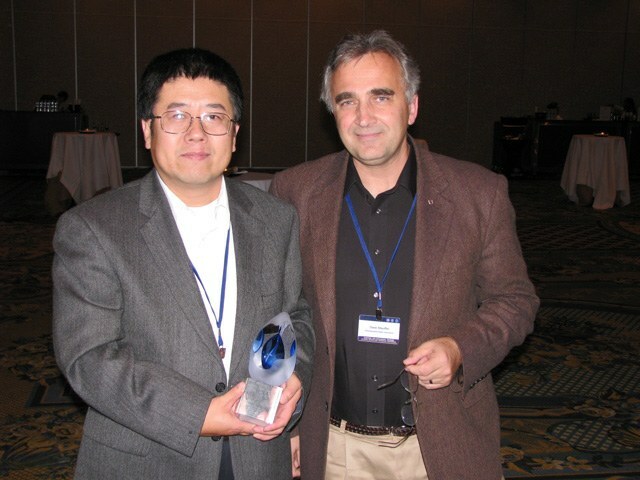 Aijun Deng and David Stauffer win award for "Outstanding Scientific Contribution"
Aijun Deng and David Stauffer accept "Outstanding Scientific Collaboration" Award. Photo by Jared Lee. Dr. Stauffer and his research group presented a total of eleven papers at the Chemical and Biological Defense, Physical Science and Technology Conference, November 17 - 21 2008, in New Orleans, LA. The award for "Outstanding Scientific Collaboration" was presented to Dr. Aijun Deng, Research Associate, and Dr. David R. Stauffer, Associate Professor, of Penn State, and Dr. Ian Sykes and Dr. Doug Henn, of Sage Management, for their paper entitled Comparison of HPAC-SCIPUFF Predictions Based on MM5 and WRF Meteorological Inputs. Dr. Stauffer and his research group presented a total of eleven papers at the Chemical and Biological Defense, Physical Science and Technology Conference, November 17 - 21 2008, in New Orleans, LA. There were more than 850 people in attendance at this conference for transformational science and technology for the warfighter, spanning many areas of the physical sciences applied to our nation's chem-bio defense program. This Penn State Meteorology Department work, combining state-of-the-science numerical weather prediction (NWP) and atmospheric transport and dispersion (AT&D) modeling, started four years ago with Dr. Stauffer's Department of Defense (DoD) Defense Threat Reduction Agency (DTRA) contract with the L-3 Titan team, and continues today with four additional DTRA contracts ranging from basic research to operational reachback support.